On April Fool’s Day, Corey and I welcomed our incredible baby girl into the world. As soon as she hit Corey’s chest she stopped crying, lifted her tiny head up and looked right at her mom for the first time. Life is not simple. It’s a sum of many parts - some joyful and some tragic. My job: find those joyful moments and photograph them. I am on a never ending mission to create imagery that is as honest as possible. Love is the hardest thing to photograph, because it is infinitely hard to define. When you see it, when you click that shutter at that perfect moment and you just know that you got it… that’s perfection. The photos below aren’t defined by the colors, the aesthetic, the poses, or the lighting. They are moments of purity in a world that doesn't always seem so pure. Casey, Matt, and their wedding party stood out in a blizzard with me for half an hour to get photos like this one. 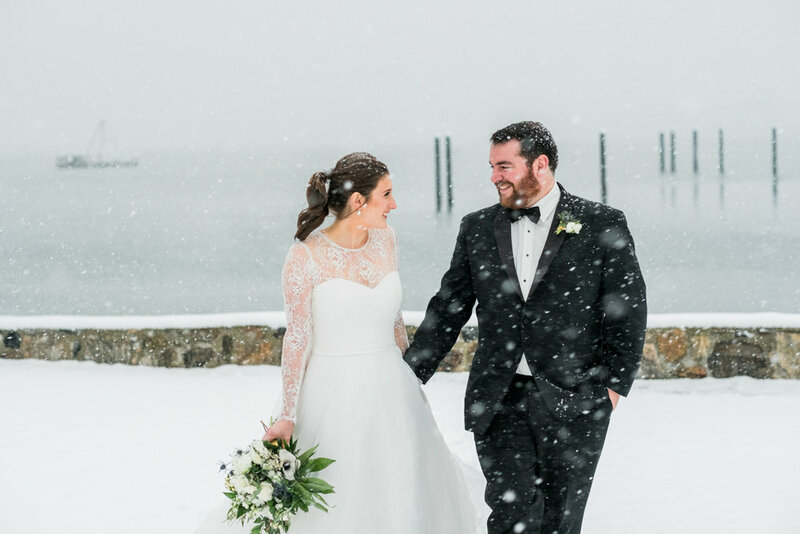 When you plan a December wedding in New England you can end up with days like these. Crazy, beautiful, perfect days. After their Catholic ceremony Melissa and Patrick arrived at the venue and took 10 minutes alone to read each other personal vows that they had written. I peaked over Patrick’s shoulder and caught this emotional moment. An easy pick for 2017. I happened to walk out of the ballroom into the bar area at the perfect moment to grab this photo. Thanks to the bartenders at Farmington Gardens for giving me the chance to capture this awesome moment. It's tradition for the bride to switch her engagement ring from her left hand to her right shortly before the ceremony. It's usually a quick moment and not always something I catch. 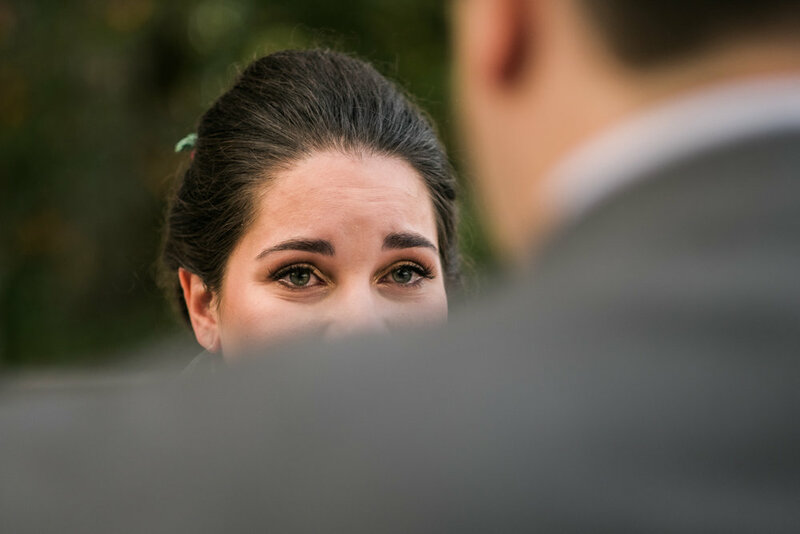 This simple, anxious, nervous gesture is one of the last things Gina did before she walked down the aisle to see Joe. One of my favorite frames from 2017. It was my third wedding of the season. I leaned over the railing to get a photo of Brooke walking down the stairs and happened to catch this perfectly candid photo of her looking back at her mom. I love this photo, and I knew, even back in March that it would end up on this list. 200,000 photos later and here we are. 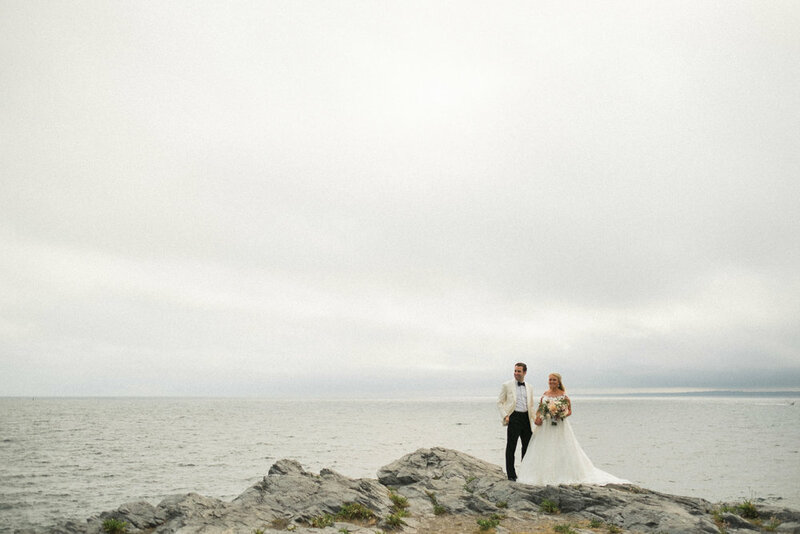 After I had finished shooting some incredible portraits with Emily, Anthony and their wedding party I stepped back to let their filmmakers roll some footage of them on the cliffs. When they both looked right and Anthony put his hand in his pocket I clicked on my 10-24 and fired a couple frames. The grain and the rain... that's what makes this photo so lovely. This is easily my favorite wedding portrait I have ever photographed. If I one day retire from this crazy job, and do some kind of career top 10, you can be certain this photo will be there. During their Cape Code engagement shoot, Larry insisted he wouldn't cry on the wedding day. When he turned away from the crowd to wipe his eyes I was lucky enough to be standing right there. This photo has some issues from a technical standpoint. Notably, my focus point was on his shoulder and not his face. He turned quickly, the moment happened fast and seconds later he turned back around and it was over. Sometimes, you break the rules on purpose... sometimes it's a mistake. As a photographer you're going to 'miss' every so often. Don't judge photo on its technical merit - judge it on the emotion. Does the photo tell a story? That's all that matters. That is everything in wedding photography. Corey and I have both always said you can judge the strength of a couple's love through the people they surround themselves with. 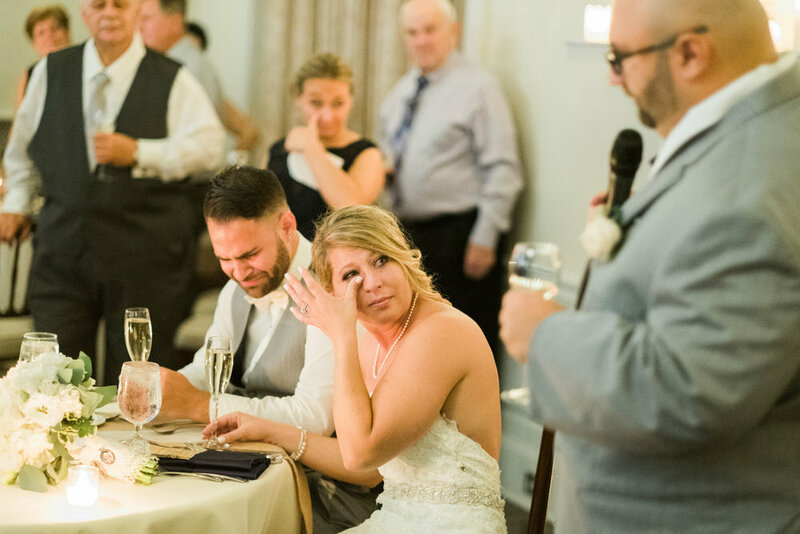 This moment, during the best man's speech, defines that strength perfectly. When you marry someone, and the joy you feel with that person brings just as much joy to the people around you - that's how you know it's for real. This is a simple, but powerful image, and an easy pick for 2017. It rained on Jessica and Colin's wedding day... hard. It really didn't stop. Nor did it stop them from having one of the more memorable weddings of my season. Rain is what you make it. It poured on mine and Corey's wedding day, but we had a blast. In this photo, after we had finished some rainy evening portraits, I stayed back as the couple made their way inside. The photos we took were cool, but this quick and candid moment is the clear winner. I love the mood, the drama, the soaking wet pathway, the unlit candles, the way she's hiking her dress...it's everything a photo in the rain should be. If Jessica and Colin werent so willing to come stand in a downpour with me, it never would have happened. I'm so glad they did. 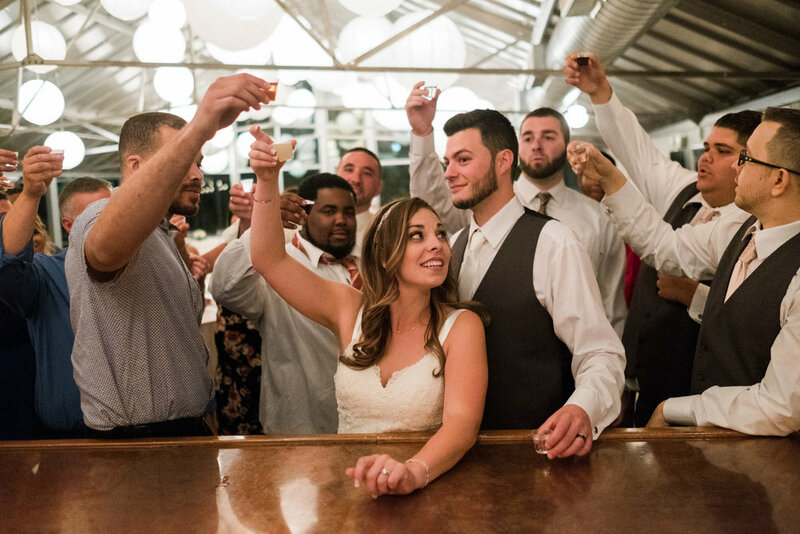 Being a wedding photographer is about meeting your couple's expectations, satisfying your own creative needs, and constantly pushing yourself to document in new and interesting ways. I had envisioned this exact photo in my head about three hours before when they were setting up the head table. During the end of the last speech of the day I slid my way behind their table and waited. I knew if they help up their glasses for a 'cheers' I would have a chance at a totally unique photo. When it happened, and when I clicked the shutter, I knew I had gotten what I wanted. I always stress to other, up-and-coming wedding photographers that you should always shoot towards people whenever possible. This is a perfect example of how effective that can be. Her beautiful hair piece, the stunning venue, and the glow from the twinkle lights certainly don't hurt. 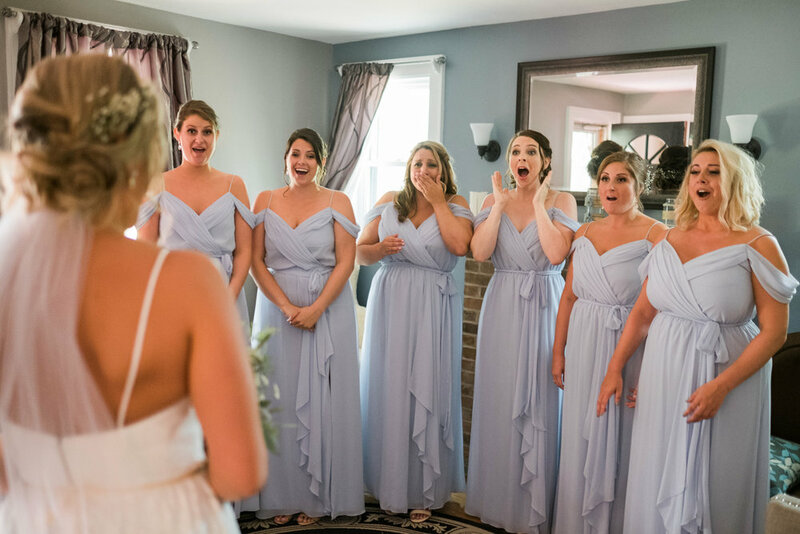 I've photographed some pretty awesome bridal-party reactions in previous years. As a photographer, you always know it's going to make for a great photo. Rarely, however, are they this great. I've never met a wedding party so incredibly excited and happy for the bride as Kristin's friends were. Their reactions are so genuine, that it overcomes the less-than-perfect framing on my part. 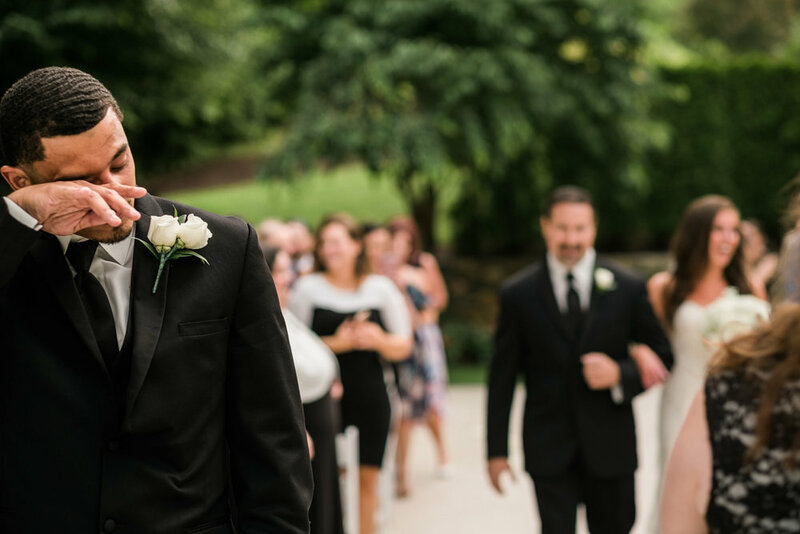 Here's another example of how emotion trumps everything else in wedding photography. It was a beautiful wedding and this was an easy pick for the top 3. There were seven photos that made my initial cut from Kate and Neil's wedding that I considered for this list, but none of the other six came close to this one. There's a lot to like about this photo; Kate's dress, specifically her traditional veil, the little lanterns lining the pews... the fact that not one person has their phone out (which I haven't seen in 300+ weddings in my career). Beyond all that is the pure and simple expression of joy coming from her father. 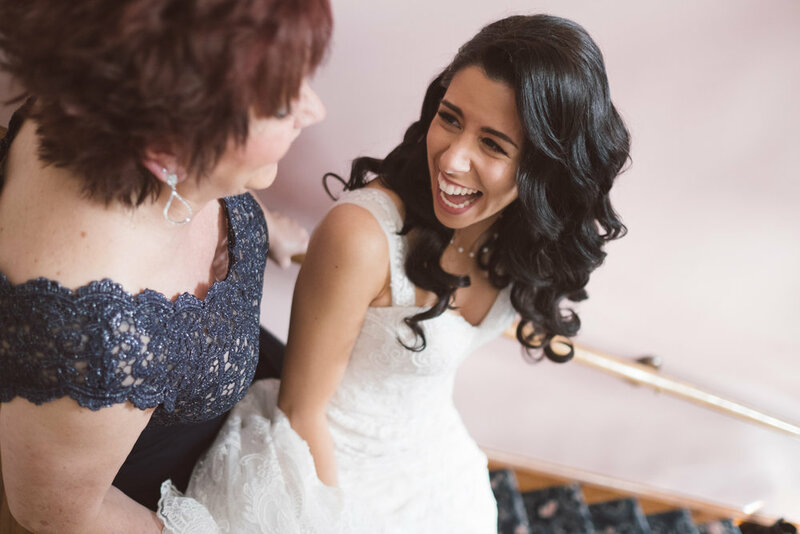 There are few traditions left in wedding photography that can be this powerful - and the one I love to photograph most is when the bride comes down the aisle in front of all of her family and friends. Every year I have to find a way to boil an entire wedding season into one single frame. This year was easy. I knew it the moment it happened. This was the first time I cried while shooting. Amanda's father passed some years ago, and she wanted to find a way to honor him at her wedding. She decided to dance her father/daughter dance with her brothers. 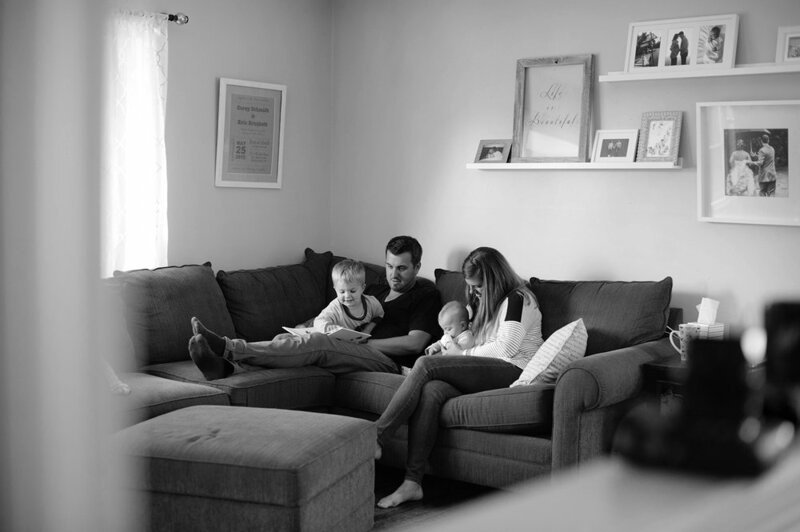 Behind them, a home video of her and her dad dancing as a baby three decades prior. I don't often express my feelings about things like politics or religion on my website. There's just no reason or need to. But at this wedding, and at this exact moment, I really felt like her father was there in the room. This photo isn't a 'wedding photo.' There are no cool poses or fancy lighting... just a bride and her brother dancing. They danced not out of obligation or tradition, but to pay tribute to their dad. A simple act that I was so honored to be a part of. Thank you for reading this year's post. I hope you enjoyed some of these photos. Thank you again to everyone. See you in 2018.